The rolling countryside, the dapple of light through tree branches, the little moments of romance you pass on a street corner—they’re visual experiences many of us take for granted when riding in a car. And for those who can’t see, the idea of looking out the window of a moving vehicle symbolizes the wide range of sights they’ll never be able to enjoy. 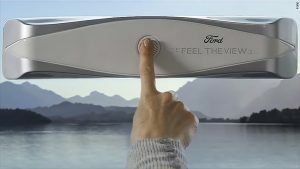 But automaker Ford’s Italian division and its local agency, GTB Rome, are trying to create a technology that gives the visually impaired a way of experiencing the view outside the window through their fingertips. “Feel the View” is a prototype technology that sits at the top of a car window. Pressing a button on the device takes a picture of the current view, and then the color image is converted into a grayscale illustration. Thanks to special LEDs in the device, the window glass becomes a screen, with each shade of gray providing a different haptic feedback to the person using it. The device can create 255 different intensities of vibration to represent the many shades of gray representing the view. There’s also a voice interface within the car, which can offer context on what the passenger is seeing. Russo says the most exciting aspect of the technology is how it could be implemented far beyond automobiles.